During a recent photography trip down to South-West Florida and a stroll through the streets of Naples my daughter discovered a beautiful monarch butterfly feeding on the nectar of some milkweed flowers. The Danaus Plexippus was very patient and a willing photographic object. At one short moment the butterfly turned towards the camera and looked straight into it. Unfortunately I was not quite ready to release the shutter and missed that shot. I am still wondering though why the monarch did not take off when I moved in closer and closer ... was he sick, lost or exhausted from a long migration? I wish I had spent more time but two ladies were already waiting in line to take their pics. Nonetheless I was able to secure three hand-held macro photography frames. For this close-up photograph I choose a f/5.6 aperture that provided sufficient depth of field. The polarizer saturated colors and eliminated distracting reflections in the image. While reducing the incoming light it made it more difficult to hand-hold the camera. As a solution I adjusted the ISO50 to an ISO100 setting which enhanced the exposure time to 1/100 second. In the post-processing I removed dust spots, applied minor lighting and color saturation settings. I also selected a tighter frame by cropping the image before sharpening. 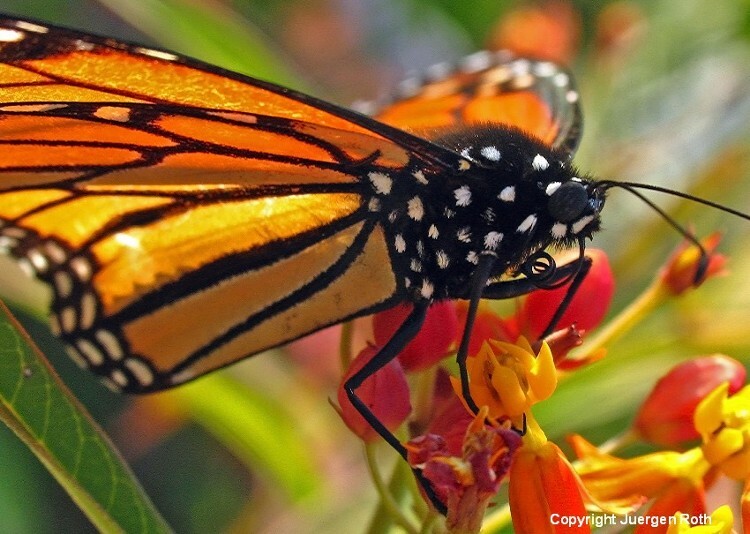 Thanks for commenting Gary ... glad you like the Monarch butterfly macro photography! It was quite something that the butterfly just went about its business and not being bothered by me ... worked for me!